Bestow your wisdom upon me. Help me see humanity through your eyes. that you hold near your heart of God. see my reflection in your tear of love. and your patience and hope for humanity. How the landscape has changed! 6:30am on a Wednesday morning I am driving toward the Owens Valley, California, via Highway 91 through Corona and north on Interstate 15. Only a few years ago I would be passing through Dutch dairy country, thousands of black and white Holsteins packed together. The smell in summer heat could take your breath away! Today dense clusters of new suburban housing cover the land as far as I can see. I will bet they now have verdant lawns and gardens! As 15 comes closer toward the mountains, dense morning fog enfolds ghostly shapes of the old vineyards of Cucamonga and Guasti. More new housing with instant avenues of palm trees crowd the gnarled, feeble vines. 15 begins the climb over Cajon Pass. Snaking lines of 18 wheel trucks wind up the steep grade. Passenger cars whiz by at 80mph toward Las Vegas. At the summit, the blanketing fog retreats and brilliant desert sun fills the morning light. The turn off to Highway 395 leading toward the Owens Valley comes quickly, so you have to be watching out for this. Previously I would anticipant empty desert landscape filled with creosote bushes and sagebrush. Once again, the ancient landscape has been scraped away for closely packed new housing. How strange to see compact neighborhoods with high walls around them, surrounded by remnants of the desert. This is Adelanto. Some of my parishioners in Santa Ana moved here to be able to buy a cheaper home and get away from the lures of gang life for their children. However, the gangs also moved here. As we passed through Adelanto the ancient desert landscape looms ahead. Soon we are back into the sagebrush ocean, which spills out for miles, as you look east or west. No fences here. Wide open spaces. Just as I prepare for a long drive through vast landscape, she appears in the sagebrush as a great surprise. When I first saw her about seven years ago, I quickly pulled the car off the road. What is that? The early morning light reflected pink and orange off a huge white statue. I drove through an open gate toward the shape. As I drew closer, the figure grew larger and more recognizable. This had to be the largest image I have seen of the Chinese Buddhist Bodhisattva Kuan Yin, the Compassionate Mother. What a surprise. Here is the middle of nowhere. What is going on here? I parked the car and walked closer. A stone walkway led to the image past a mobile home. The 25-foot image expressed the traditional iconography of Kuan Yin. She is cloaked in white, the color of purity. Sometimes she is holding a rosary of Buddhist prayer beads. She could also have a book of the Lotus Sutra. Here in this desert she holds a vase, symbolizing her pouring compassion into the world. I have seen her image holding a child, which is a reminder that she is the patron saint of barren women. She could also be standing on a dragon, a Taoist image of alchemy and eternal life. Two woman stand in front of the image, one holding a stick of incense between her hands in reverence. They are chanting Kuan Yin’s mantra: “Om Mani Padme Hum (Hail the Jewel/pearl in the Lotus).” They are sharing Darshan: the Hindu/Buddhist state of prayer in which one sees and is seen by the Divine. By doing darshan properly a devotee develops affection for the deity and the deity develops affection for the devotee. As I gaze at the women in deep devotional chanting, I see a love affair with the divine. 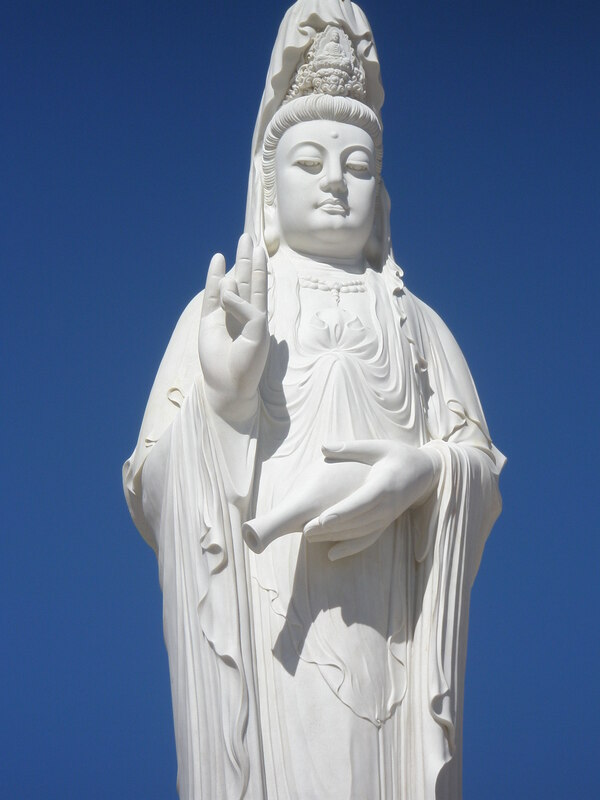 One of the women shared with me that she heard about the healing power of Kuan Yin and that here in the desert her powers were stronger than anywhere else. She often emanated a white light and people saw a rainbow covering her head. The woman had lifelong arthritis in her shoulders and arms. Her frequent visits to the shrine healed her so that the pain has almost disappeared. She picks up a bottle of holy water from the altar nearby that has increased Chi potency through Kuan Yin’s blessing. A short, stout man wrapped in monk’s robes walks toward us. Monk Thich Dang “Tom” Phap was a captain in the South Vietnamese Army from 1965 to 1975. After capture by the Viet Cong, he spent two years in prison. He had seen much suffering and death. After his release, he was able to come to America. He had a dream one night in which the Buddha called him to be a monk. And here he is. The Buddha also gave him a vision of a meditation center in the middle of a desert. He has an incredible gift of raising money. Every time I drive by the center, there is new activity, expanding gardens, and imported statues from Vietnam, Non Nuoc, the stone craft carving village of Da Nang. In 2011 a magnificent new Buddhist temple was built as the centerpiece of devotion. 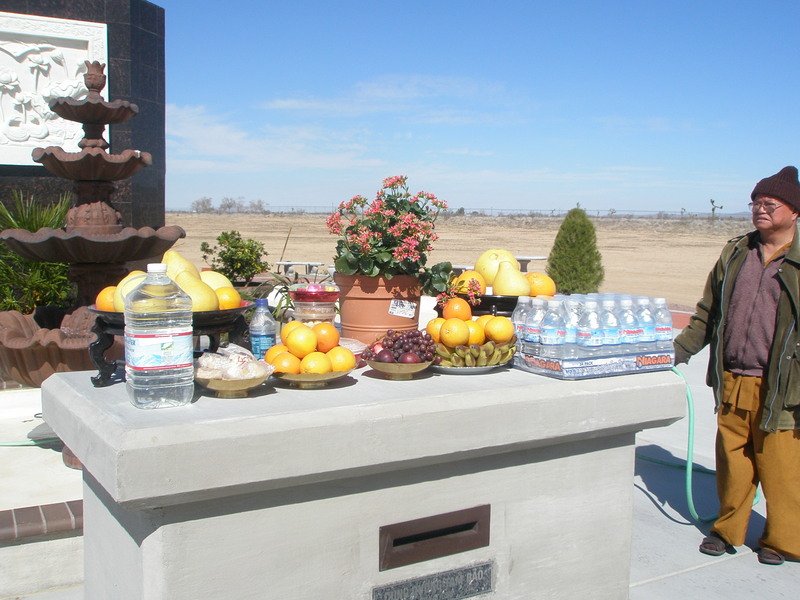 Every weekend hundreds of Asian Buddhists journey from Orange County and as a far away as San Francisco to this place of potent healing by the compassionate Mother of the Desert. The birth of Buddhism has similarities with the Great Spiritual Awakening in America that began in the later 1960s. Vedic Hinduism had evolved into a complex system of rituals, requiring expensive and time-consuming efforts by many priests. In the 6th century BCE. the religious traditions of India became disconnected from popular piety. People moved out to the forests. Under the guidance of a guru and varieties of yoga, people experienced personal enlightenment through union of their soul/atman with Brahman/God. They experienced metanoia, life-changing encounters with the Holy. The sermons and instruction of these gurus inspired another set of sacred scripture, the Upanishads. In America of the later 1960s, people turned to these Eastern practices of meditation for life changing experiences. Up to that time, the word “spirituality” was not in common conversation. It was a word that was identified with monasteries and monks like Thomas Merton. Traditional Christianity, a core value of American culture, was in crises. People were seeking personal communion with the Holy. Siddartha Gautama was born into a cultural cusp of emerging spirituality in India. Raised in a protective royal enclave, with every desire satiated, he became aware of a hollow emptiness in his heart and escaped from the walled palace into the world, where he saw for the first time a sick person, an aged person and a dead body. He saw a naked shramana, who wandered about owning nothing. He tried many paths toward enlightenment. He became the most austere of ascetics. But still no peace. Giving up the efforts, he returned to what was familiar to him: perhaps a form of Raja Yoga. Meditating under a tree under the light of the full moon of May, his mind became still. As he fell into the deepest levels of consciousness, he remembered all the details of his past lives, the endless steam of existences. He saw the lives of all other creatures, their struggles, triumphs and failures. He could perceive the rhythm of their lives: birth, death, birth death, the endless pulse of samsara. In deep, focused meditation, he could see the pattern of this ceaseless flux of change/samsara. Those whose lives were based on compassion and generosity were reborn in a higher state. Those who gave into greed and violence and hatred were reborn in a lower state of suffering. Like an Indian doctor he diagnosed the core spiritual problem of existence. Birth and death followed from craving and attachment. With the ceasing of craving, the cycle of birth and death and suffering ceased. Siddartha had become the Buddha, the awakened one. He was no longer subject to samsara. This diagnostic process became the Four Noble Truths. The Fourth Truth is the pharmaceutical prescription: the Eight Fold Path. It is a life process of waking up to our true nature. The key vehicle for waking up is meditation. Our hearts filled with desire and anxiety move back and forth from the past, which cannot be reactivated and the future, which by definition is that which is not yet. What is real is the Present Moment, this present breath. Meditation is the guide to awakening to what is real and seeing how we have created a world of false permanence, in which we believe we are self-sufficient entities. As the movement begins, only the full time monk could be dedicated to this way. It is really a self-help method. No gods, dogma, or rituals can help you. This Theravada Buddhism was lived in the sangha monastic community. As Buddhism traveled into other lands, it developed flexibility. Not all of the Buddha’s teachings (Dharma) were written down. Some were in secret given only to elect disciples. This allows for interpretation. In addition, the belief increased that the Buddha was not only a man, but also a supernatural being. There were other beings, Bodhisattvas, who had achieved release from the cycle of life and death, but remained in this world out of compassion to help all of us over the river of life. 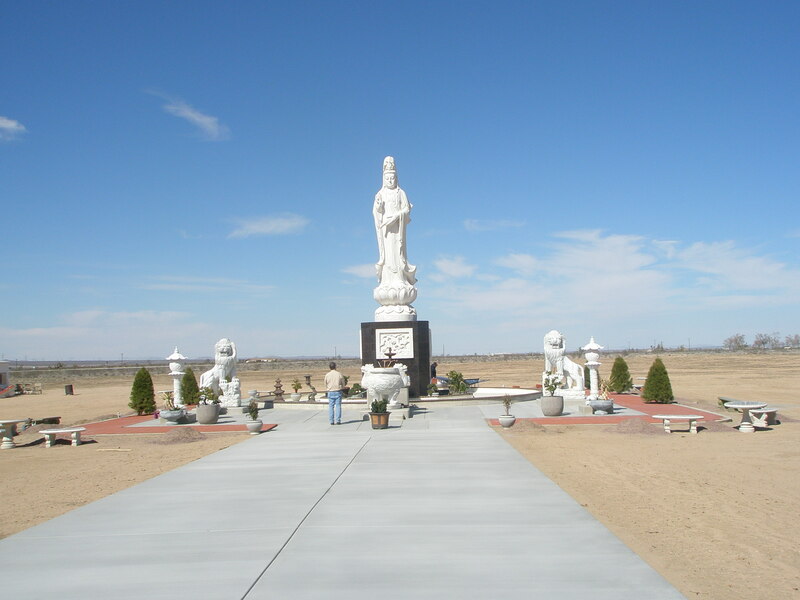 This is Mahayana Buddhism, the religious version expressed at this temple in Adelanto. And this is the Compassionate Mother Kuan Yin. Just as the reverence for the Virgin May may be a reaction to patriarchal control of the Church, Kuan Yin is a feminine bodhisattva who is more popular than any of the male bodhisattvas. She has been honored in every Asian home as the most powerful spiritual being. I asked one of the women: how does Buddhism help her become more compassionate? She said that wisdom and compassion go together. They are like two eyes that help us see reality and to wake up to our true nature. Compassion/karuna is an active sprirituality: we are willing to bear the pain and suffering of others. We are to selflessly respond to alleviate any suffering that we encounter. Meditation softens our hearts. But we need the help of Kuan Yin to do this great work. I visit the Center each time I travel north toward the Owens Valley. 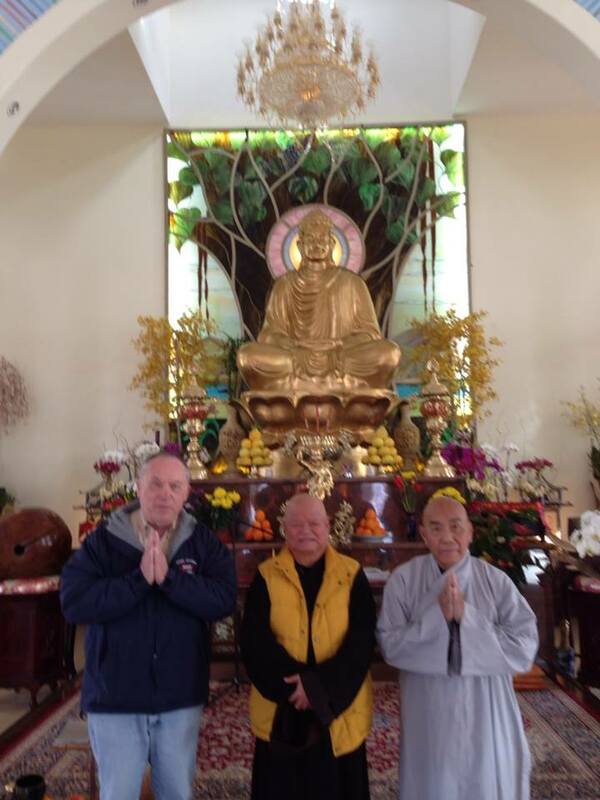 I now have these new spiritual friends, the two sisters and Monk Tom. And I have Kuan Yin’s blessing as I travel the most dangerous portion of Highway 395, which is between Adelanto and the junction with Highway 14. “Buddhism: Plain and Simple” by Steven Hagen. A clear, straightforward explanation of the Four Noble Truths and Eight-Fold Path. I appreciated the parables, stories and anecdotes with a great sense of humor. It seems that these mystics, who have spent a lifetime in prayer or meditation, have a powerful sense of joy and humor. This entry was posted in Blog and tagged Adelanto, Buddhism, compassion, desert spirituality, Kuan Yin, meditation. Bookmark the permalink.